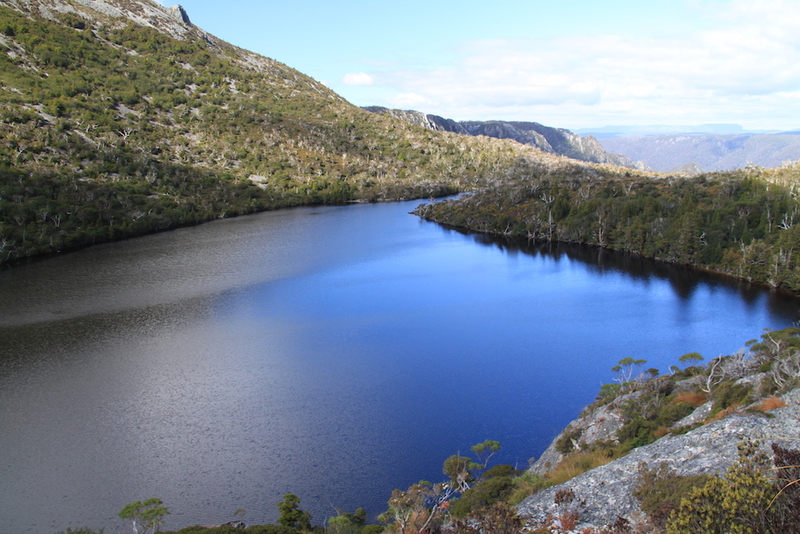 Cradle Mountain is situated in the Cradle Mountain-Lake St Clair National Park in the North West of Tasmania, the most southern state of Australia. 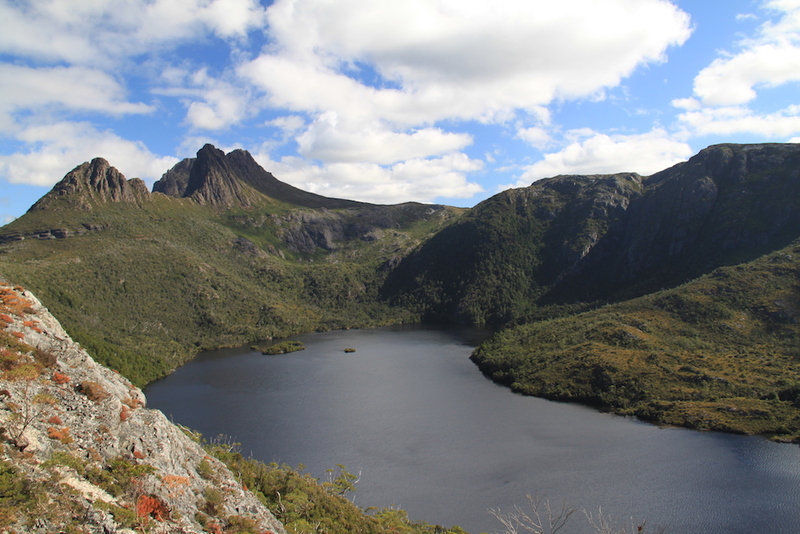 It is a pleasant two and a half hours drive from Launceston and is the most visited national park in Tasmania. 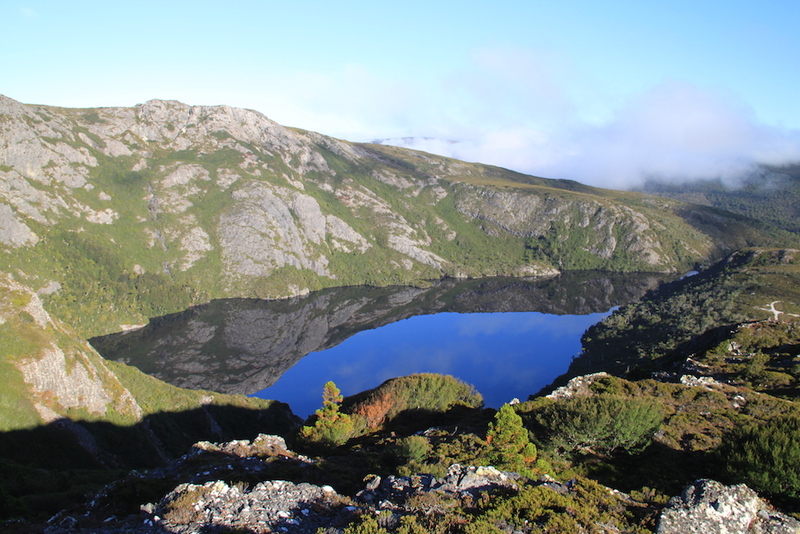 It is also one of the prettiest national parks in Australia. The park has many attractions such as wildlife spotting, lots of walks and hikes, helicopter rides, fishing, mountain biking and more. 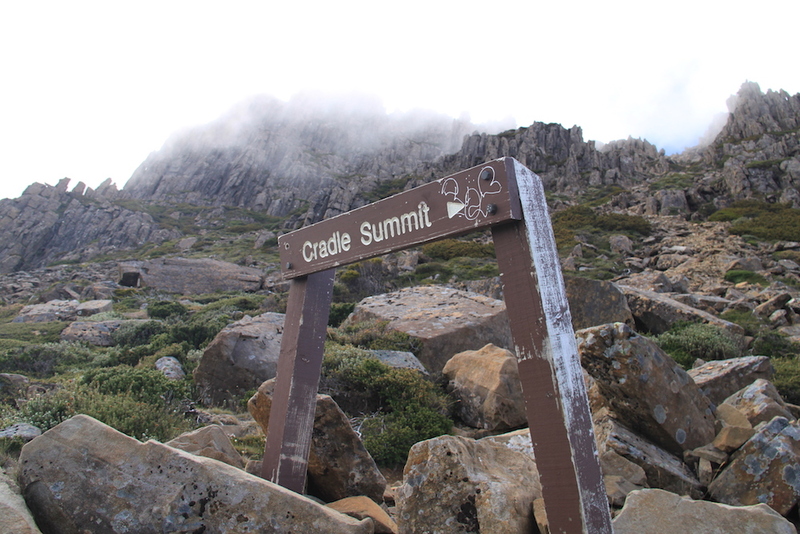 During our visit we decided to tackle the Cradle Mountain Summit hike which is one of the nicest but also one of the hardest day hikes in the park. 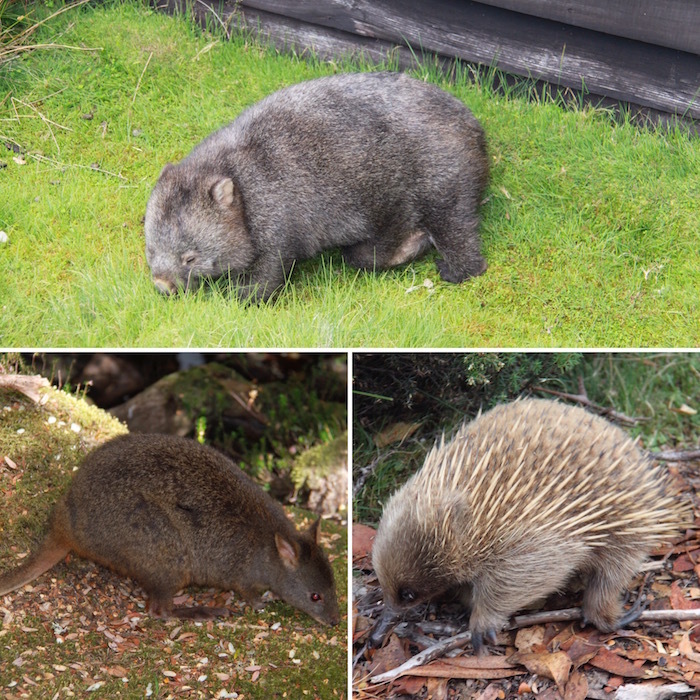 Some of the friendly Cradle Mountain residents! The summit hike is not for inexperienced hikers and requires a descent level of fitness. 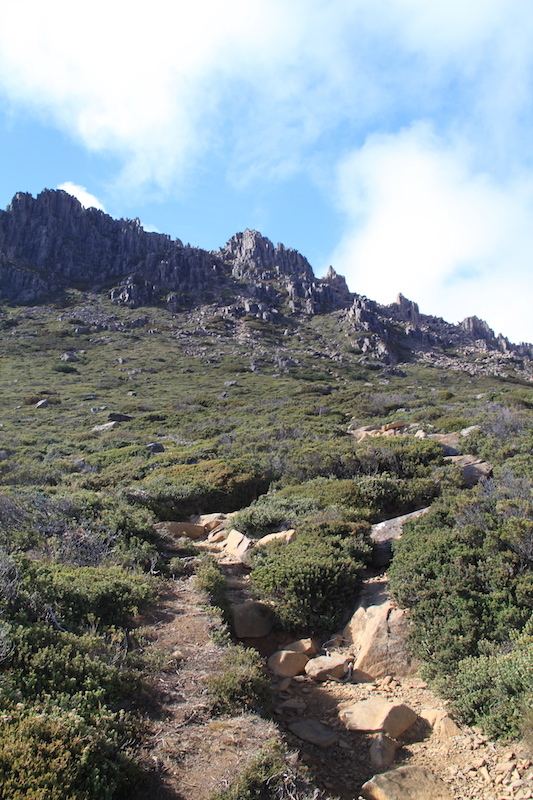 The hike takes between six to eight hours return and is not suitable for all weather conditions. Before attempting the hike you should talk to the park rangers the day before to check out the expected weather conditions. I would not recommend to start this hike on an icy or rainy day. 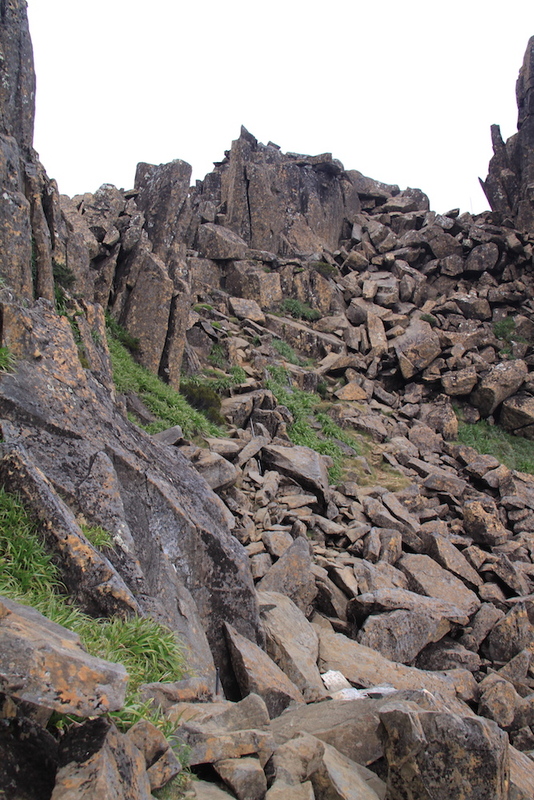 There is a fair amount of large boulder climbing and they do get extremely slippery in bad conditions. 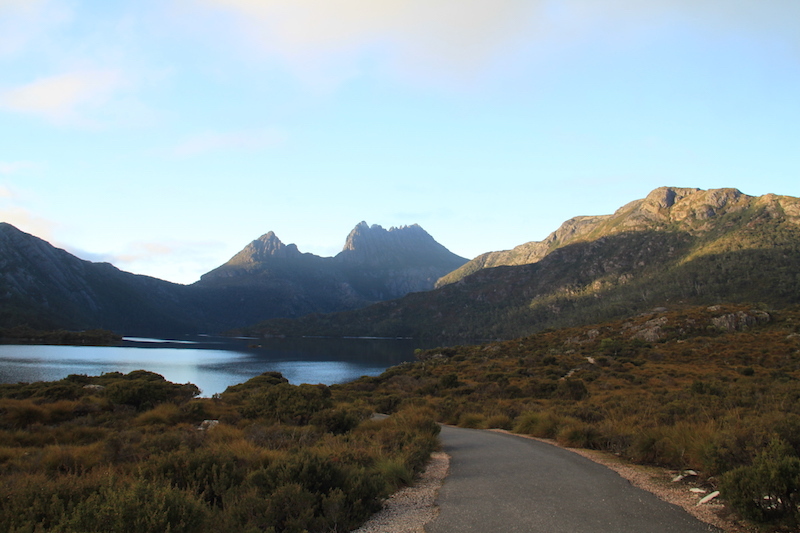 The many hiking possibilities from the Dove Lake carpark! On the morning of our hike we woke before sunrise, dressed really warmly, had a big hearty breakfast and made up our picnic lunch. 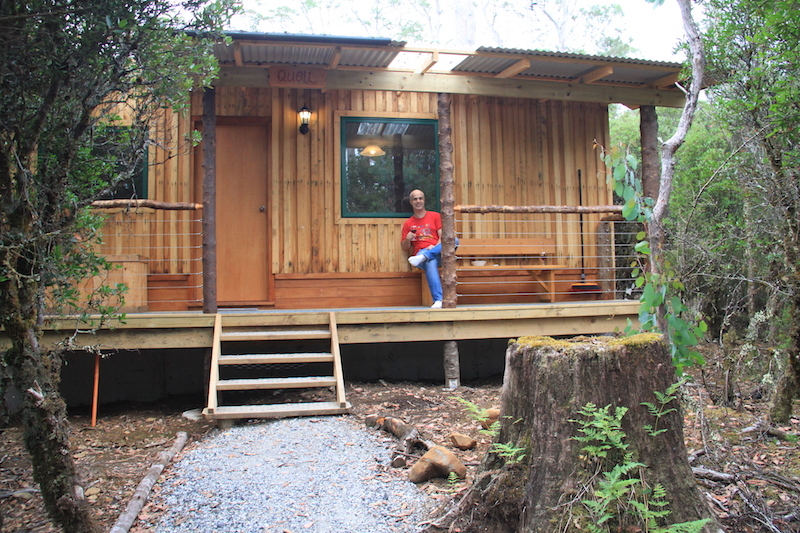 We then left our lovely bush cottage at the Cradle Mountain Highlanders just as sun was rising. 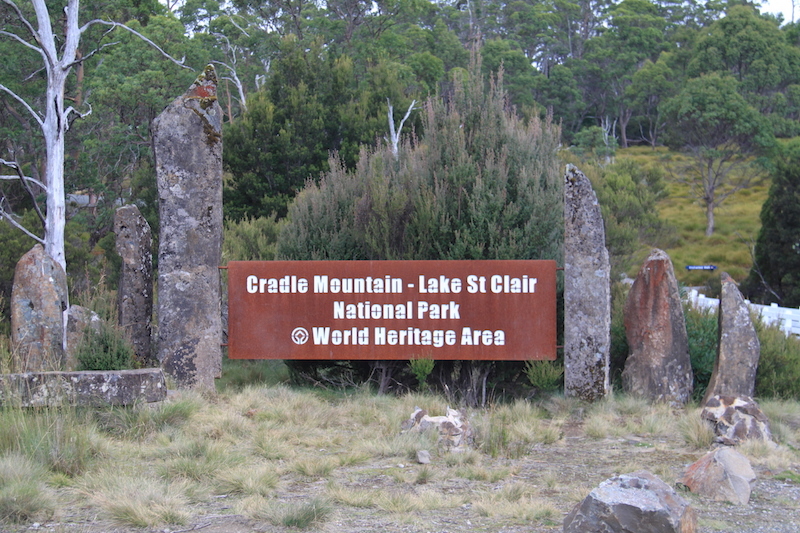 The start of the hike is at the Dove Lake car park which is a fifteen minutes drive from the Cradle Mountain Visitor Centre. 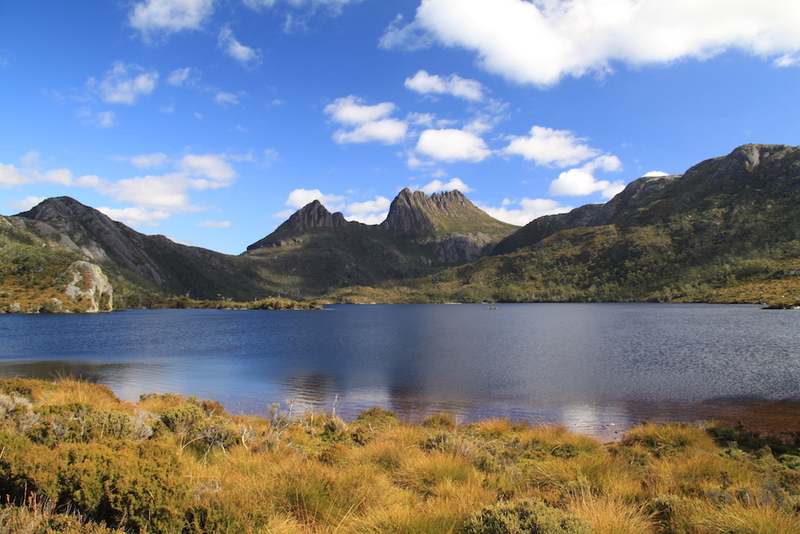 As soon as you arrive at the car park you will be amazed by the stunning views of the Cradle Mountain and Dove Lake. Knowing that you are preparing yourself to hike to the summit is pretty exiting. It does look like quite a hike from the bottom; and believe me it really is! After a few minutes spent taking in the views and snapping a few photos, we started our hike heading in the direction of Marion’s lookout. 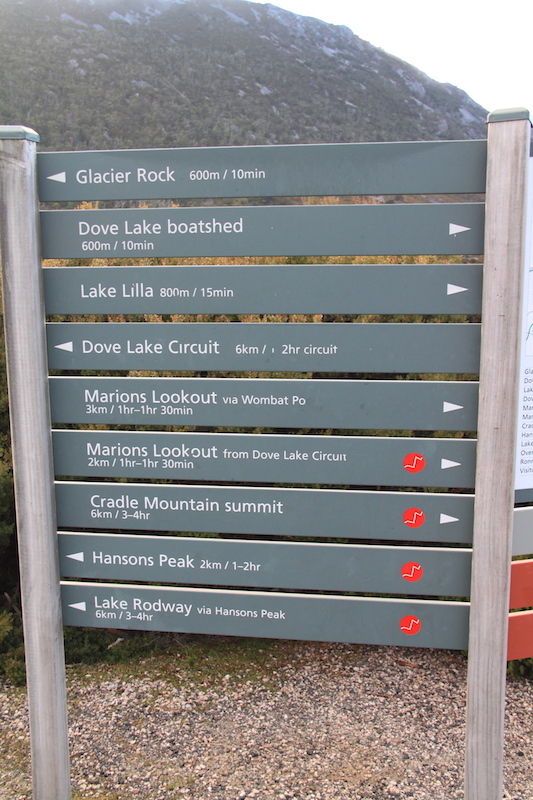 There are two ways to reach Marion’s Lookout; via Wombat Pool (the easiest option); or via the link track off the Dove Lake Circuit (shorter but much steeper and a lot harder). We chose the second (I can’t remember why now!). The climb was definitely quite rough and ascended almost three hundred meters. It took us over some steep steps with a little bit of rock scrambling, but the hardest parts were rope assisted which certainly helped! 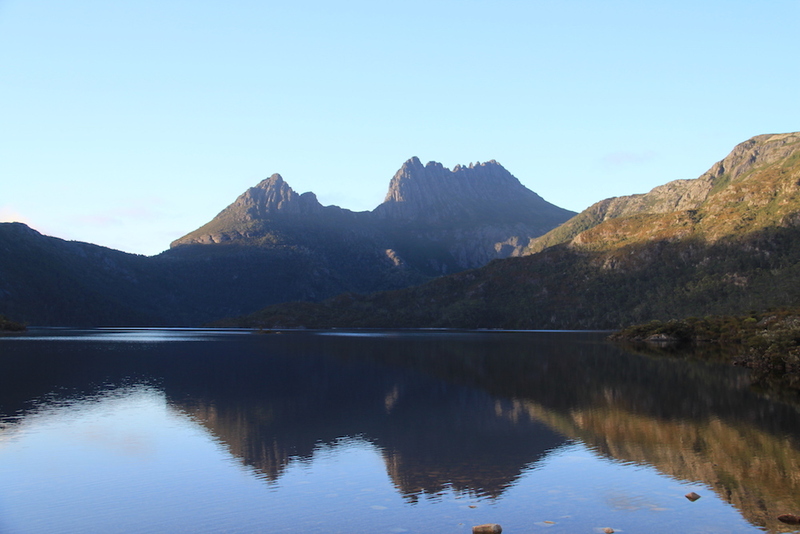 Once you reach Marion’s Lookout the splendid views over Crater Lake, Dove Lake and Cradle Mountain certainly make it worth the effort. As we caught our first glimpse of Crater Lake it was covered in fog but after a few minutes it cleared out and gave us some amazing views. Always remember that sometimes fog can disappear very quickly! 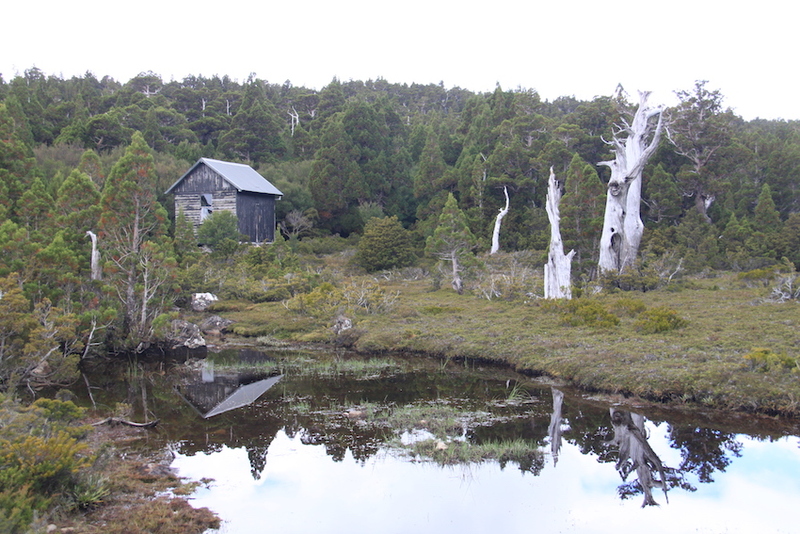 After a thirty minute pit-stop at Marion’s lookout to recover and enjoy the stunning scenery in front of us, we followed the famous Overland Track across the Cradle plateau all the way to the Kitchen Hut. 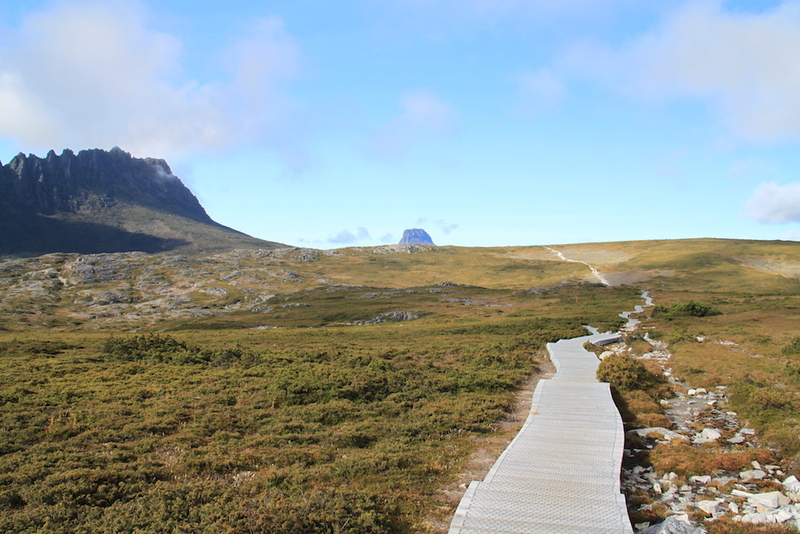 This section was relatively easy, flat and on boardwalk all the way to the base of the Cradle Mountain. Passing the Kitchen Hut we arrived at the junction where the hike to the summit begins. Then the real fun began! 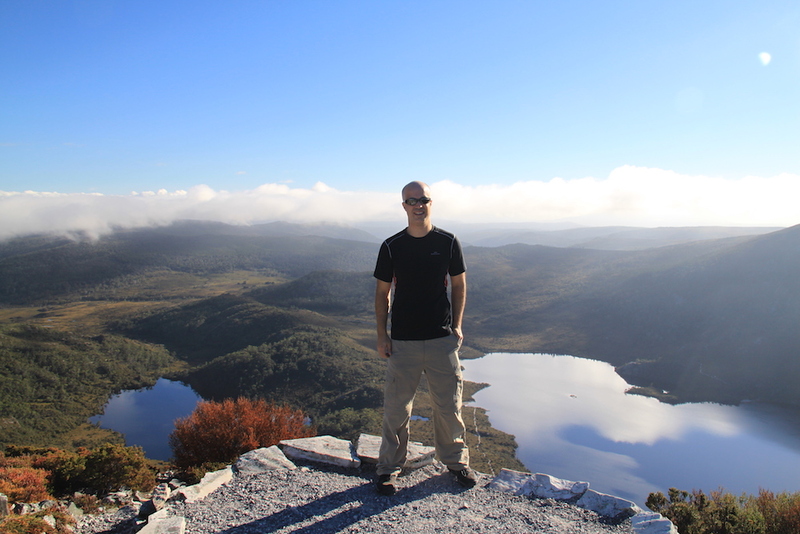 Hiking Cradle Mountain was definitely one of the hardest hikes we have done so far. It was well marked but there were many, many boulders to climb across. I am quite short at five foot, so pulling myself up over boulders was really tiring after the first few! What made it worse was the fact that some parts were just really scary. It felt like if we slipped we will most certainly fall to our own death. I wouldn’t recommend this hike to anyone scared of heights! The beginning of the climb… the easy part! Many minutes and many boulders later we finally made it to the top. Of course the view from the top once again was totally worth the struggle up. We were lucky that the weather held for us and we did not get any rain even though at times it felt like the weather might turn on us. But thankfully it remained dry for the rest of the day. The awesome view from the top! After an hour spent at the top enjoying the views and having our coffee and picnic lunch, we made our way down. If the way up was scary the way down was twice as bad! But we made it back down alive with no falls or twisted ankles which was a miracle! 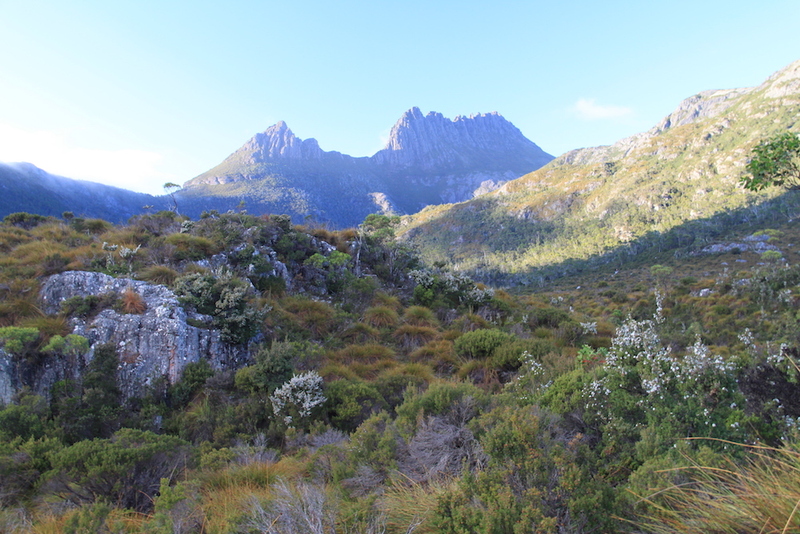 As we got back down to the base of Cradle Mountain it was still early afternoon and the sun was still shinning so we decided to hike the Face Track. 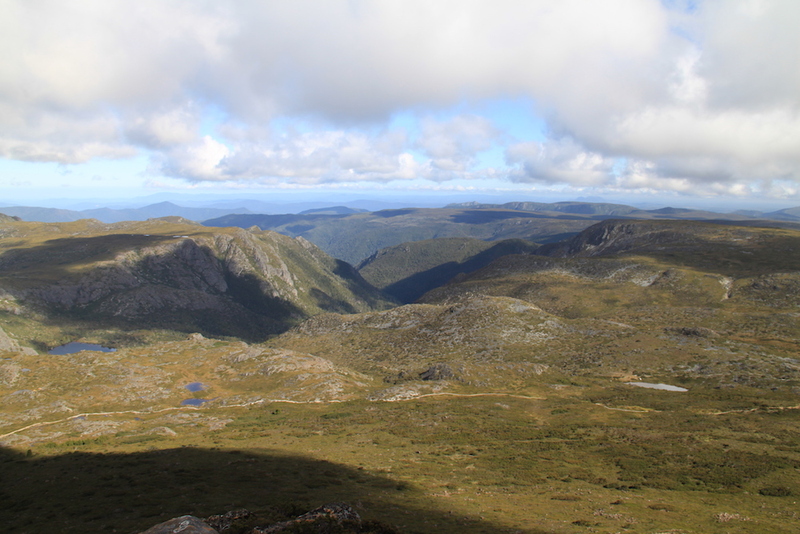 The Face Track took us around the edge of the mountain range towards Hanson’s Peak and around Dove Lake. 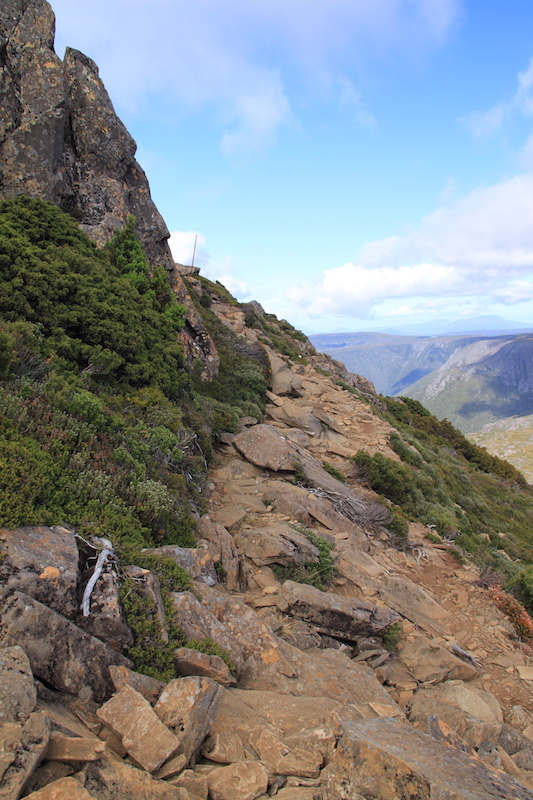 This trail was again very exposed, so again I wouldn’t attempt this hike in bad weather. 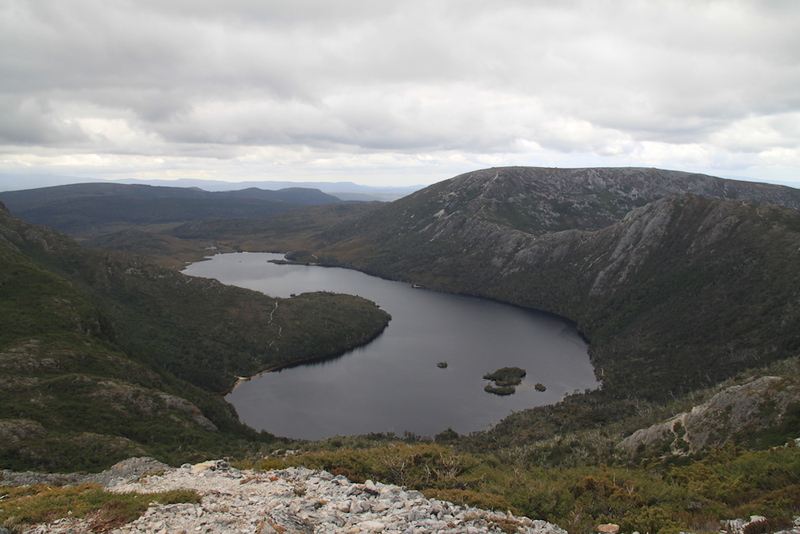 Walking the Face Track will give you great views over Dove Lake and Little Horn. Just before we arrived at the base of Hanson’s Peak we came to the junction for the Twisted Lakes. We decided to follow this track because it was recommended in our guide book. 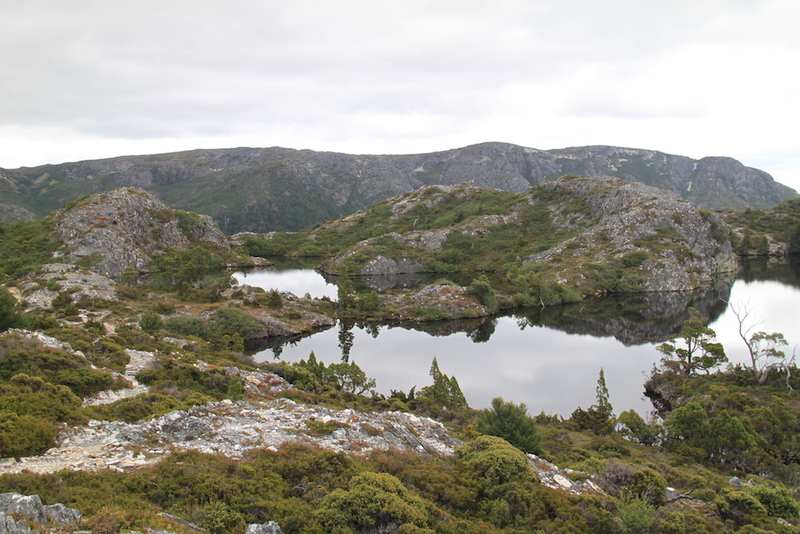 It offered really nice views over mountain tarns but the track was not as clearly marked as the previous ones. A few times we thought we had gotten lost before we found our way again. By that point we were both pretty tired from a huge day of hiking and I personally could barely feel my legs anymore. Every steps was an effort and my legs were shaking! 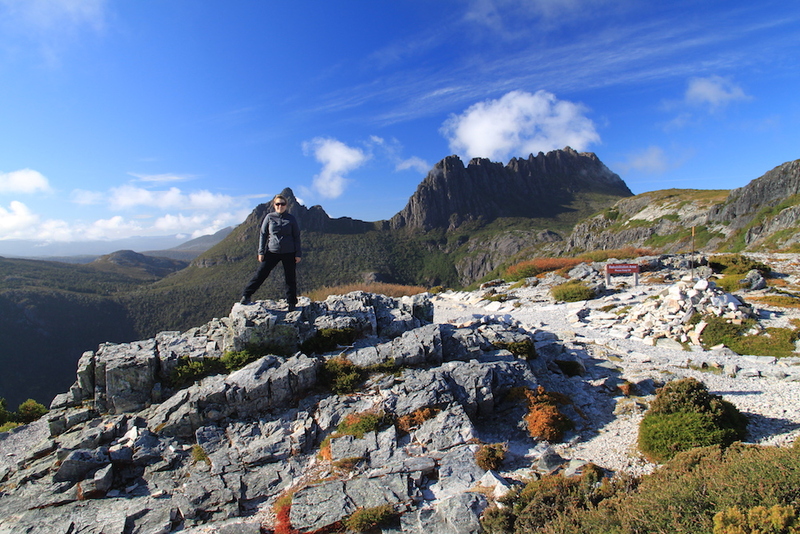 By the time we had descended Hanson’s Peak and got back to Dove Lake’s carpark we were both exhausted and pretty glad it was over. Getting back to our cute little cabin in the woods to a glass of wine and some wildlife spotting after a long day of hiking was heaven! It was definitely an amazing day but be prepared if you decide to hike both the summit and the face track on the same day that you may not be able to hike again the next day. We were so sore the following day that we could only do very short walks. But then again on our second day the weather was so bad that we couldn’t even see the lake standing on its shore so it’s best to make the most of it when the sun is shinning. With Tasmania you just never know how long it will hang around! 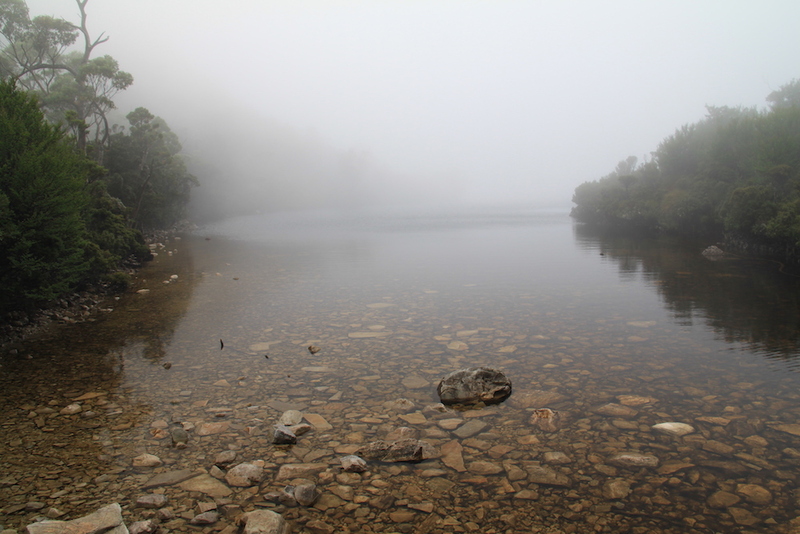 A very foggy morning on our second day but the water was crystal clear! 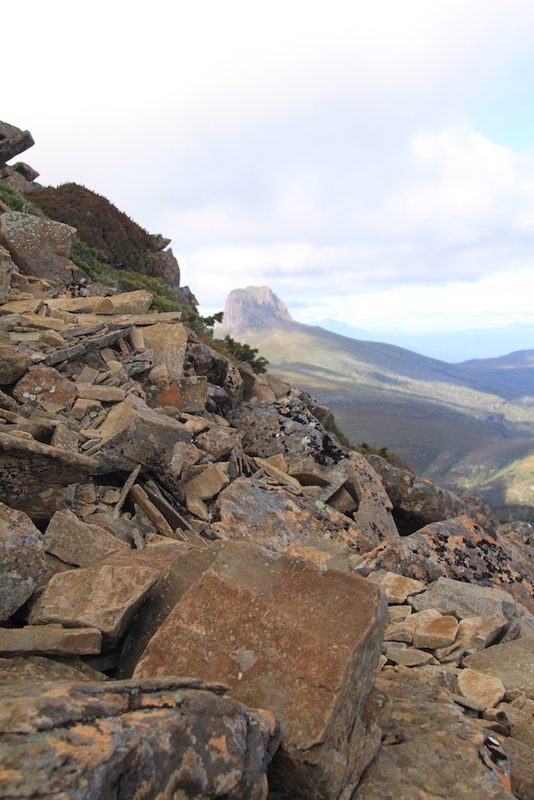 Wear proper hiking boots, it is a dangerous track and it is extremely slippery! Always check the weather forecast. Pack a picnic, snacks, hot drinks and lots of water. Bring a rain jacket and a change of clothing in case you get wet; the weather at the mountain is very unpredictable. Wear thermals; it will be really cold when you first start in the morning and as you stand at the top of the mountain. Dress with layers you can add or remove to adjust your body temperature. You will warm up pretty quickly climbing up; but as soon as you stop you will get cold again! Grab a map at the Visitors’ Centre. Start early, the earlier the better. If you don’t arrive at the car park early you may not be able to park. There is also a shuttle to the carpark from the visitor centre if you prefer not to drive or are not an early riser. Bring toilet paper with you, there is a toilet at Kitchen Hut but no paper. Do what you can, none of this is a competition, if you can’t carry on then stop. A few people have died attempting this hike so it’s always better to be safe than sorry. Stay within the limits of your ability. Relaxing by our cabin at the Highlanders after a long day! 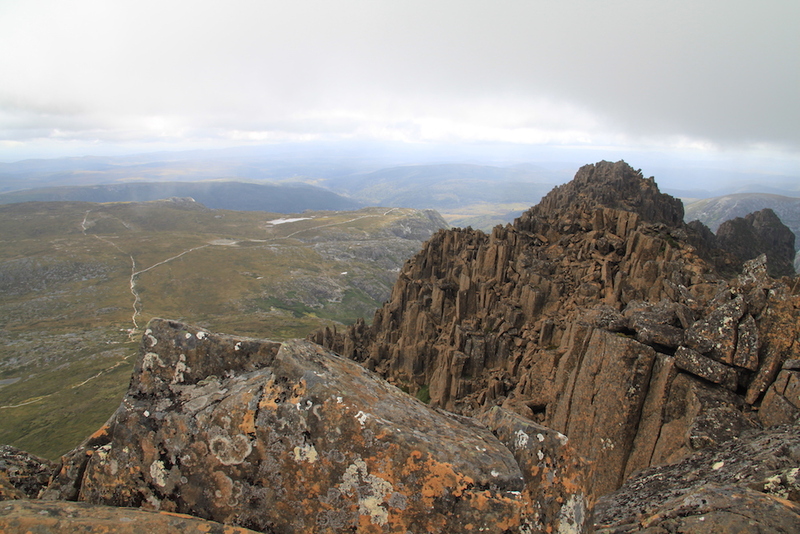 I just came across your article about the Cradle Mountain Summit walk. My husband and I ( and our reluctant 17 year old son) are planning do the walk in January 2017. But reading your post has given me many things to consider. 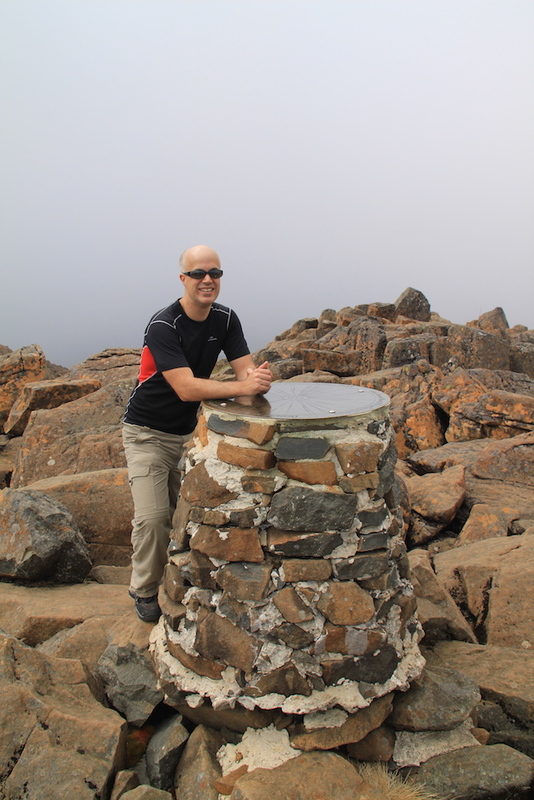 My husband is a very experienced hiker (he rock climbs in the Blue Mountains regularly) and I have done some hikes but nowhere as hard as the Cradle Mountain Summit walk. I am also quite short and have fear of heights. I am planning to do some training prior to the walk but I am getting nervous about the fear factor after reading your article. But thanks very much for giving me a realistic perspective of the walk.